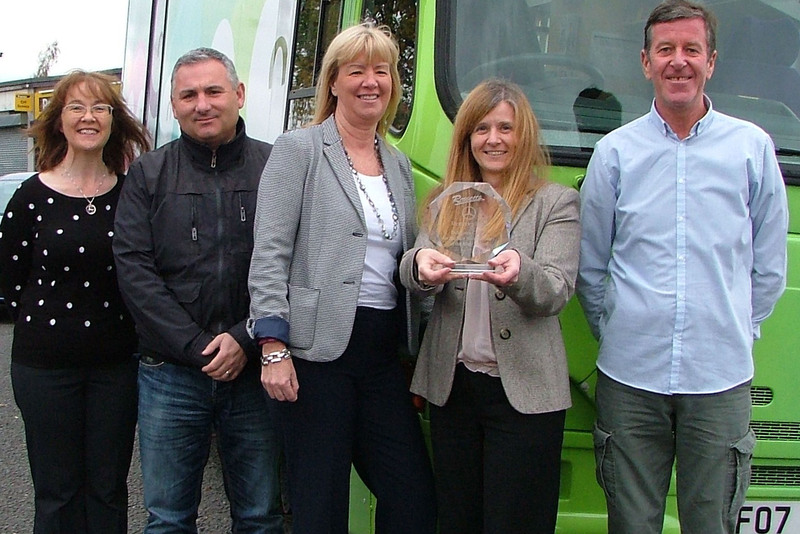 THE Skoobmobile children’s library bus in Renfrewshire has motored its way to a top award. It won the Delegates Choice Award for the Best Mobile Library at a national conference.The Skoobmobile impressed delegates at the conference organised by the Public Library and Mobile Library Group, which is part of the Chartered Institute of Library and Information Professionals, held recently in Staffordshire. When delegates came to choose the best mobile library in the country, the Skoobmobile won with 60 per cent of the votes. As well as carrying a wide variety of children’s books, the refurbished mobile library is a flexible space, which can be adapted for different activities taking place inside.The Skoobmobile, launched earlier this year, has visited many schools, nurseries and community events, in Renfrewshire. It promotes play, literacy and learning for children up to 12 years and the bus has free Wi-Fi on board, along with iPads for youngsters to use. Award pic caption: From left, Joyce Higgins, digital and libraries development manager; Jimi McGuigan, children and families mobile worker; Joyce McKellar, Renfrewshire Leisure chief executive; Pauline Simpson, mobile library co-ordinator with the award and Laurence Doherty, children and families worker.